We are bringing hope for this life and the life to come to a world in desperate need of genuine hope. This hope is found in Jesus Christ and through the proclamation of the truth of God's Word. A message from the Preacher. 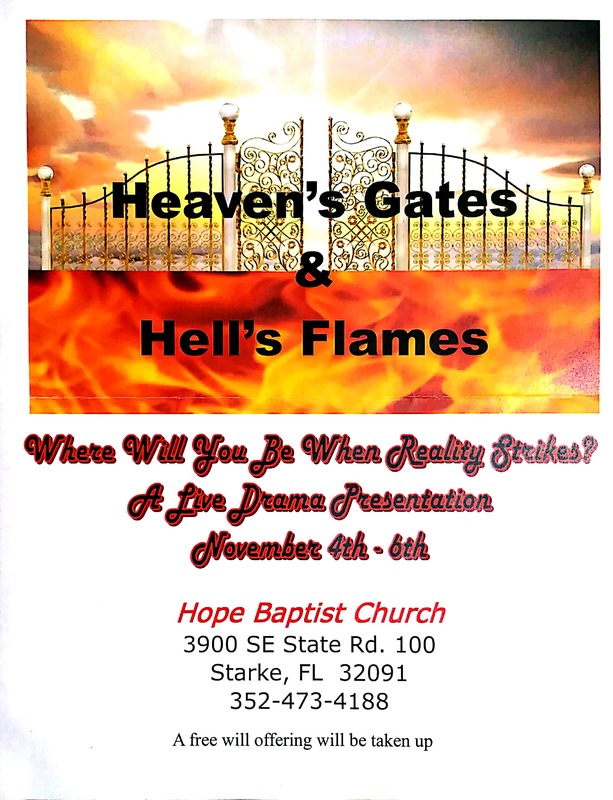 Welcome to the Hope Baptist Church web site! We at Hope desire to love God with all our hearts, and we want to invite you to join with us as we earnestly seek to follow our Lord and Savior Jesus Christ. In our world of confusing messagages about what is truth, Hope Baptist Church stands strong on the only source of truth God has given to this world. That is the Bible. Our goal is to share the truth of God found in His Word that will bring hope to your hearts and set you free to serve and follow the God who has made us for Himself. Come and get connected here in this spiritual family and grow together with us. It might just be the best decision you will make this year. will be Friday, April 26th. If you have any questions, please contact the school office at 352-473-4040. The Church bus runs in Keystone Heights Sunday mornings at 8:30am and Wednesday evenings at 5:30pm. will be Sunday March 31 to Wednesday April 3rd. See the flyer. will be Saturday April 6th. There will be a Turkey Shoot from 3-5pm and dinner will start at 5pm. The Guest Speaker will be Mr. Blake Albritton. Contact the Church office for any questions and to purchase tickets.